Anyone that has zucchini plants growing in their backyard knows you do not need to have a green thumb to get a bumper crop of zucchini! Don’t know what to do with your bountiful harvest? How about making this simple and unbelievably tasty recipe for Italian Style Sauteed Onion and Zucchini Rounds. It all begins with some caramelized onions. Then it is just a matter of adding some garden-fresh zucchini, some herbs and some spices. A quick sauté, and you’re done! 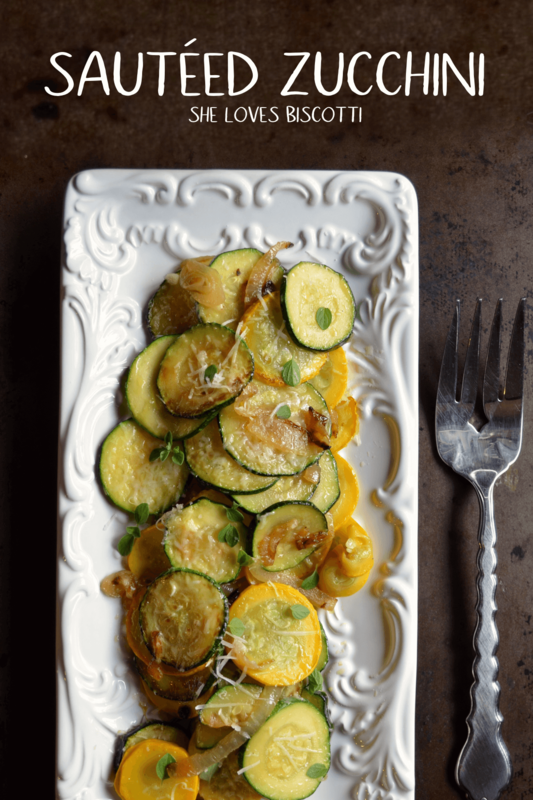 In less than 20 minutes, you can be enjoying this healthy side dish of sauteed zucchini. If you still have a lot of zucchini leftover, may I suggest giving it away to your neighbor in honor of Sneak Some Zucchini onto your Neighbor’s Porch Day! ……..Yes. Really. There is such a day. And according to this resource, August 8th , is that day. One can only assume that this movement was started because zucchini is truly easy to grow and provides such a bountiful harvest. So it’s back to my Italian-Canadian upbringing for this sauteed zucchini and onions recipe. I’ve already mentioned how I grew up in a household where certain meals were set for certain days of the week. For example, Tuesday and Thursday suppers as well as Sunday lunch was reserved for pasta dishes. No exceptions. Ever. This recipe for Italian Style Sauteed Onion and Zucchini Rounds was part of the line-up for Friday suppers, which back then were always meatless (I’ve already shared with you another favorite of mine, Cacio e Uova Meatless Recipe). 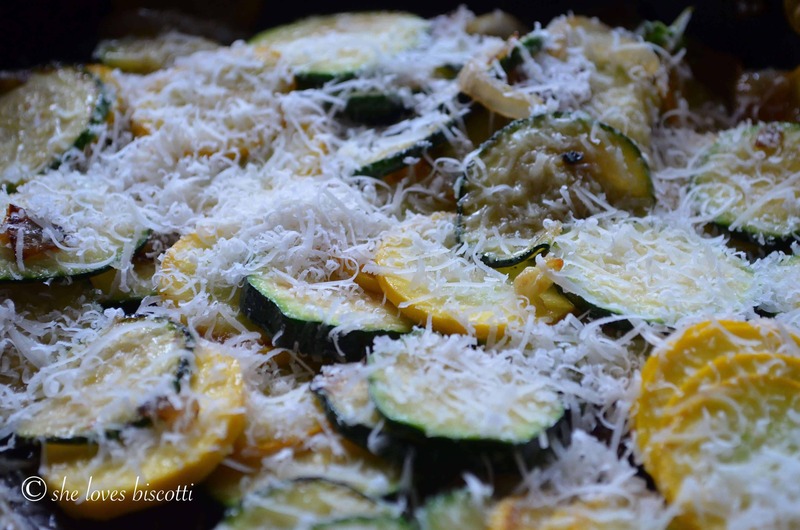 I vividly remember my Mom making this Italian zucchini dish. She would always have two pans going… there were many mouths to feed… When these fantastic vegetables (onions) and fruit (zucchini) attained their golden perfection, a few well beaten eggs were gently stirred in. The final addition would be a generous addition, and I mean a GENEROUS addition of Parmesan cheese. When I am making this recipe as a side dish, I will omit the addition of the eggs. If, on the other hand, I am making this recipe for brunch or a light lunch, I will add the eggs. The addition of the beaten eggs to the zucchini and onions is, of course, totally optional. Don't like zucchini? Bet you'll love this recipe! Simple,unbelievably tasty & healthy-Italian Style Sauteed Onion and Zucchini Rounds. Ready in 20 minutes. 1/4 -1/3 cup grated Parmesan cheese. Heat 1 tablespoon of olive oil in a very large skillet over medium-high heat. Add onion and reduce heat to medium. Cook, stirring occasionally until just beginning to caramelize, about 5-7 minutes. Add remaining 2 tablespoons of olive oil. Add sliced zucchini, garlic, and spices. Saute, while stirring and shaking the pan frequently, until golden brown. This should take between 4-7 minutes. Zucchini should be cooked, but still be crisp. OPTIONAL STEP: Add the eggs and cook over medium heat. Stir and shake the pan for 2-3 minutes until the egg is cooked. Add cheese and gently combine. ITALIAN ZUCCHINI RECIPE, SAVE IT FOR LATER. Love your site, personal stories, recipes… THANK YOU!! Wow! 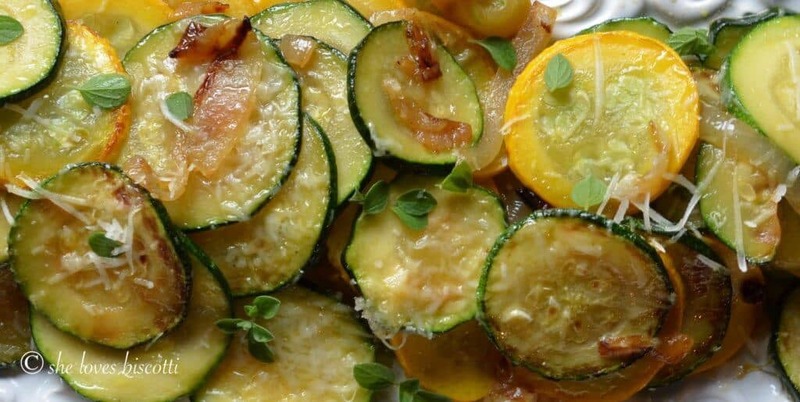 This recipe might be the one to actually convince my kids that zucchini can be delicious! And, well, if not… more for me!! 😉 Love this! Your comment brought such a smile to my face …thankyou. Keeping my fingers crossed for you 🙂 Truly appreciate you dropping by. Great timing. I was going to make some complicated squash casserole, but was just not up to it. I just finished making this simple, delicious dish and I’m just as happy. Thanks.